We present the case of a 69-year old male patient, obese, dyslipidemic, former smoker (30 pack-years) who was admitted for shortness of breath and orthopnoea started two days before. His past medical history consisted of deep vein thrombosis in the left lower limb for approximately two months that was therapeutically neglected. Clinical examination revealed: sinus tachycardia 110 bpm, blood pressure 110/70 mmHg, respiratory rate 32/minute, oxygen saturation 88% at room air, no fever, and painful and swollen left lower limb. aspects, we decided to perform systemic thrombolysis to the patient. We have chosen streptokinase with the following regime: 250 000 UI in bolus for 30 minutes, followed by 100 000 UI / hour for 36 hours. Afterwards, unfractionated heparin was continued until proper oral anticoagulation was obtained. 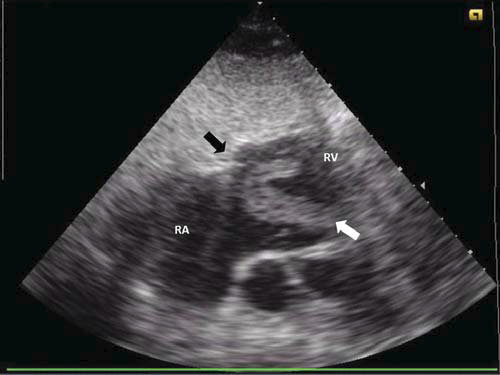 Echocardiography reevaluation after 24-hour postthrombolysis showed the absence of intracavitary thrombus with RV function improvement, normal kinetic of IVS, RV systolic pressure reduced to 23 mmHg (estimated systolic pulmonary arterial pressure – 35 mmHg), TAPSE 20 mm (Figures 3, 4). Figure 1. 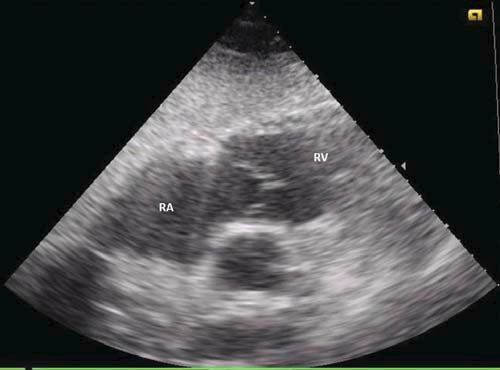 Subcostal view: serpiginous mobile thrombus (white arrow) prolapsed during diastole from right atrium (RA) into right ventricle (RV); black arrow indicates tricuspid annulus. Figure 2. 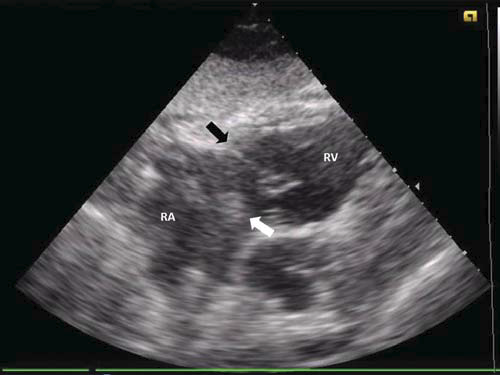 Subcostal view: same mobile thrombus (white arrow) located in RA during systole; black arrow indicates tricuspid valve. Figures 1 and 2 indicates the mobility of the thrombus during cardiac cycle. Figure 3. 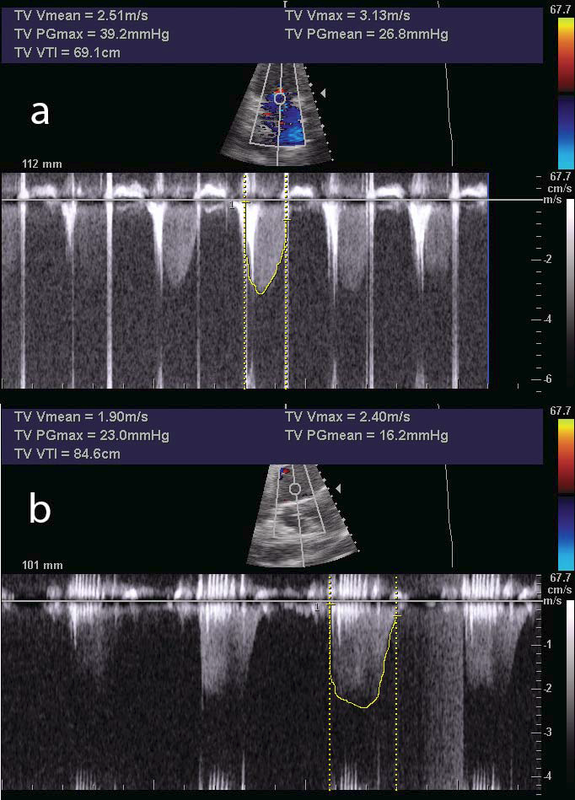 Tricuspid regurgitation continuous wave Doppler velocity before (a) and after (b) thrombolysis showing the acute reduction in right ventricular systolic pressure (from 39 to 23 mmHg). Figure 4. Subcostal view: absence of thrombus after 24 hours of thrombolysis. Pulmonary artery computer tomography revealed normal main pulmonary arteries with distal thrombus in the left pulmonary artery and non-occlusive thrombi in subsegmentary branches (Figure 5). The patient evolution was favorable during hospitalization, without hemodynamic impairment or postthrombolysis complications. After seven days, the patient was discharged with indication of oral anticoagulation for long term. seven had a good evolution while two subjects had to perform adjunctive surgery because the persistence of massive thrombus6. Thus, surgical embolectomy represents another treatment option and is indicated especially in hemodynamically unstable patients where thrombolysis is contraindicated or ineffective. However, more evidence suggest that this procedure is associated with low mortality when early performed and may be extended to hemodynamically stable patients with RV dysfunction7. Pulmonary hypertension (PH) is another positive element for PE, with good prognosis both for the diagnosis and chronic thromboembolic pulmonary hypertension. In our case, the acute PH was moderate (55 – 60 mmHg) and after thrombolysis the value reduced to 35 mmHg. This may be explained by the rapid and effi cient onset of thrombolytic treatment which has been proven to better reduce the acute PH compared to patients that did not receive thrombolysis8. Moreover, the presence of RA thrombus might be another contributor to the increased PH at presentation. should be performed in order to establish which method is more effi cient and with lower risk. 1. Konstantinides SV, Torbicki A, Agnelli G et al. 2014 ESC guidelines on the diagnosis and management of acute pulmonary embolism. Eur Heart J 2014; 35(43): 3033-69. 2. Rose PS, Punjabi NM, Pearse DB. Treatment of right heart thromboemboli. Chest 2002; 121(3): 806-14. 3. Torbicki A, Galié N, Covezzoli A, Rossi E, De Rosa M, Goldhaber SZ. Right heart thrombi in pulmonary embolism: results from the International Cooperative Pulmonary Embolism Registry. J Am Coll Cardiol 2003; 41(12): 2245-51. 4. Athappan G, Sengodan P, Chacko P, Gandhi S. Comparative efficacy of different modalities for treatment of right heart thrombi in transit: a pooled analysis. Vasc Med 2015; 20(2): 131-8. 5. Nkoke C, Faucher O, Camus L, Flork L. Free Floating Right Heart Thrombus Associated with Acute Pulmonary Embolism: An Unsettled Therapeutic Diffi culty. Case Rep Cardiol 2015, doi: 10.1155/2015/ 364780. 6. Pierre-Justin G, Pierard LA. Management of mobile right heart thrombi: a prospective series. Int J Cardiol 2005; 99(3): 381-8. 7. Samoukovic G, Malas T, deVarennes B. The role of pulmonary embolectomy in the treatment of acute pulmonary embolism: a literature review from 1968 to 2008. Interact Cardiovasc Thorac Surg 2010; 11(3): 265-70. 8. Casazza F, Bongarzoni A, Forgione C, Cuccia C, Imperadore F, Arrigo G, Floriani I, Pignataro L. Echocardiographic evolution of pulmonary artery pressure after acute pulmonary embolism. Results from IPER registry. Thromb Res 2014; 134(6): 1224-8.